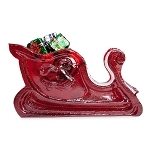 Our 3D Candy Reindeer is made from an antique 3D candy mold. Available in a variety of color flavor combinations. Each sleigh is hand-poured; slight variations will occur.